This large,evergreen shrub explodes with eye-catching yellow flowers in the spring. It is popular planted on slopes and hillsides.It requires some space as it reaches 10'-20' high and 15' wide.Provide course, well draining soil to make sure your Fremontodendron thrives. Be very sure not to overwater once this shrub is established. If possible, plant your Fremontodendron in late fall so that it is established before the summer, avoiding the danger of overwatering. The dry hairs on the leaves can be irritating to skin, so it is best to plant this away from high-traffic areas. 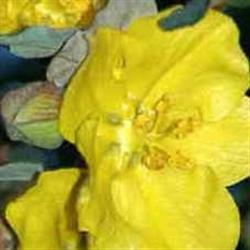 Fremontodendron californica is native to the Sierra Nevada Mountain Range, coastal areas and dry slopes. It is both hardy for cold weather and drought tolerant. Amazing flowers, so far easy to grow doesn't require much attention.